Apple has rolled out another minor update to iOS 7.x.x running devices to fix known bugs, and bring improvements to various iOS devices including all latest iPhone and iPad devices. The latest iOS 7.0.4 update is available now to download on iPhone and iPad devices using Apple’s Over-the-Air update, and as well as complete / fresh download of the update. 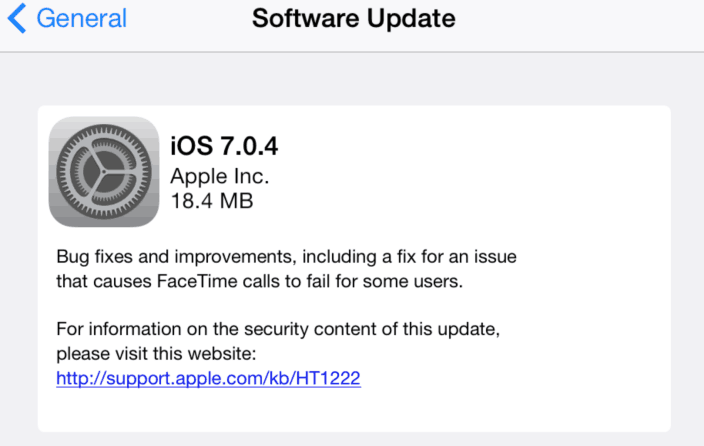 The iOS 7.0.4 download is available now in your iOS 7.x.x running devices under ‘Software Update’ section. Furthermore, you guys can download the complete update by clicking any of the below mentioned download iOS 7.0.4 links. You can download iOS 7.0.4 update from above mentioned links, but if you are interested in older iOS 7 download links then click here.